Free Parking and EVERYONE Welcome! Globally balanced. Main and share plates. A refined culinary take with a sense of familiar. Thoughtfully selected, locally available and ethically sourced ingredients. Clever house-made twists. Glacier fed lakefront setting with towering mountains situated at the legendary Nicklaus North Golf Course. Entertaining liveliness mixed with relaxation. It's not a clubhouse, it's a second home. 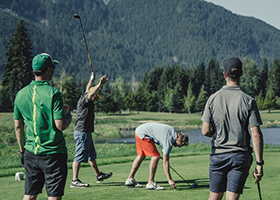 The Clubhouse at Nicklaus North Golf Course is open year-round and welcomes groups of all sizes. Our restaurant, Table Nineteen, offers a variety of spaces to accommodate your wedding, private celebration or corporate retreat. Our lakeside patio features a covered awning, outdoor furniture and firepits, providing the most amazing outdoor event and dining spot in Whistler. We are able to accommodate events up to 150+ people. For more information on Events, visit our Event Planning section. *Golf season opening date is weather dependent, and may change.